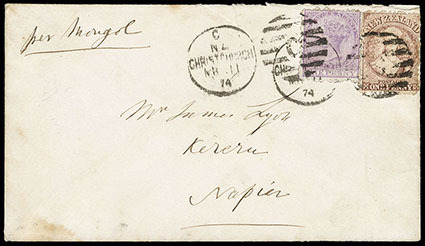 New Zealand, 1871, Queen Victoria "Chalon Head", 1d red brown, perf 12½, Large Star watermark, used with 1874, 1d lilac (152), tied by two strikes of "Christchurch, Mar 11, 74" duplex with "C" barred circle on cover to Napier, endorsed "per Mongol" at top left, reverse with Napier (3.15) arrival backstamp; small cover edge tear, Very Fine and rare, Maurice Burrus, Robson Lowe, July 1963, lot 320. Scott No. 39 var. Campbell Paterson No. A1q (2). SG No. 132 Estimate $2,000 - 3,000. A RARE CHALON HEAD AND SIDEFACE COMBINATION USAGE, OF WHICH ONLY THREE OR FOUR HAVE BEEN RECORDED. Discussed and illustrated in Robin Gwynn's article, "Combination First Sideface and "Chalon Head" Usages, New Zealand Stamp Collector, Volume 88, No. 2, June 2008. 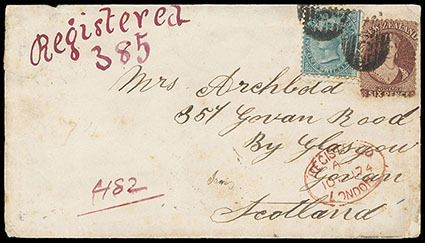 New Zealand, 1871, Queen Victoria "Chalon Head", 1d red brown, perf 12½, Large Star watermark, used with 1874, 1s green (177) with double perfs at bottom, tied by numeral "20" medium barred ovals, "Greymouth, MR - 26, 74" origin cds backstamp on registered cover to Scotland, magenta "Registered 385" number, Nelson transit backstamp, red "London Registered, 10 JU 74" arrival transit, reverse with Glasgow (6.10) transit and Govan (6.11) arrival backstamp; some soiling and edge wear and edge tear at left, a Very Fine, John Woolfe, Spink, October 2006, lot 328. Scott No. 39 var. Campbell Paterson No. A1q (2). SG No. 132 Estimate $3,000 - 4,000. A RARE CHALON HEAD AND SIDEFACE COMBINATION REGISTERED USAGE, OF WHICH ONLY THREE OR FOUR COMBINATIONS HAVE BEEN RECORDED. This cover was carried by ship from Auckland to San Francisco, then U.S. transcontinental railroad to New York, then NGL "Rhein" to Southampton.